Greetings from Juba, The Current Capital of the Republic of South Sudan. We as South Sudanese have done it, our President and all the people of South Sudan from all works of life have finally done it all. We are now free people in the 54th Country in Africa and 193rd in the world. Yesterday, January 7, 2011 was a historic day to all the South Sudanese People across the world when we finally receive the final result of the most peaceful referendum in the world. Today our President who arrived from Khartoum has delivered a statement in regards to the announcement. 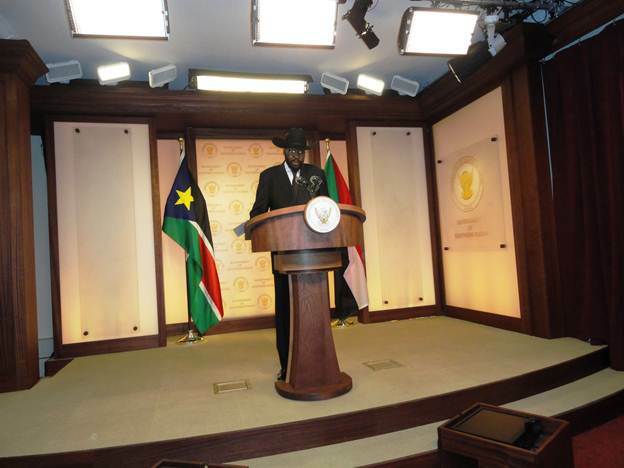 Below is the Statement of the President of the Republic of South Sudan, H. E. Gen. Salva Kiir Mayardit. The announcement of the final result of the Referendum has marked the end of an era and today is the beginning of a new era in our history. Today is a glorious day for all the sons and daughters of Southern Sudan. It is a glorious day for the people of the Republic of the Sudan. It is a glorious day for Africa and the world. You have exercised your inalienable right to self-determination freely, fairly and peacefully. You have expressed your freewill over your future. By this official result of 98.83%, the whole world has heard your voice loud and clear! You have voted for freedom, equality, justice, and democracy. You have voted for the fulfillment of the ideals that inspired our struggle from its inception in 1983. This result is the crowning moment of all the sacrifices we made during our long struggle. As a people, you have chosen the path to permanent peace. You have chosen the path to human dignity. And you have chosen the path to nationhood. As we celebrate the announcement of the final Referendum result, we honour the memory of our fallen heroes and heroines foremost among them, our dear and valiant leader, Comrade Dr John Garang De Mabior. Twenty eight years ago, Dr. John Garang de Mabior, alongside other brave and resolute SPLM/A leaders, launched a struggle for liberation; a struggle unlike all struggles that preceded it. This result is testimony that our martyrs did not fall in vain, for they made our past heroic, our present great and our future full of promise. They laid down their lives so that we may live as free men and women. It now remains for us – the living – to complete the magnificent work they had commenced. Their memories shall live forever in our hearts and in our minds. I would like to take this opportunity to express our sincere words of appreciation to all those who contributed magnificently to the signing of the Sudan Comprehensive Peace Agreement (CPA) in 2005 and made this day to become a reality. First among those commendable leaders is my brother Field Marshall Omer Hassan Al-Bashir, President of the Republic of the Sudan and his colleagues in the National Congress Party (NCP). I commend them for their bold decision to choose peace rather than continued war. Second, I pay tribute to IGAD countries, IGAD Partners Forum (IPF), the AU, the EU, the Arab League of Nations and the UN for their firm stand to support the Sudanese people in their long search for permanent peace. On behalf of the people of South Sudan and on my own behalf, I can honestly say that there are no fitting words to express our gratitude to you. Indeed, there is no fitting tribute for your persistence and dedication to bring an end to one of Africa’s longest civil wars. We thank you and we look forward to your continued support in building this emerging nation. To President Bashir and the NCP, we will work together to help Sudan regain its pride. We will assist in persuading the world to remove sanctions from Sudan. We will appeal together for the removal of Sudan from the countries in the list of terrorist countries. We will review the debt situation and seek debt relief from the International Financial Institutions and affluent countries. We will work together to expeditiously resolve the Darfur conflict. This is our sincere promise and commitment as a reward for your collaborative efforts in the full implementing of the CPA. Dear Citizens, today I call upon all of us to put behind the long and sad history of war, hardship and needless sacrifice imposed by violent conflict. Nonetheless to say, we are also mindful that the legacy of war will stay with us for some time to come. By this referendum, we have ended one struggle and now we must start a new one, that of nation building. We must consolidate our institutions and begin to play a major role in the region and among the community of nations. From now henceforth, we must protect this new nation and ensure that we do not end up in the same situation which we fought against. Never again shall the people of Southern Sudan be oppressed for their political outlook. Never again shall the people of Southern Sudan be discriminated on account of race or religion. Today, we make a solemn commitment to democracy; to pluralism, to the rule of law; to freedom of thought, belief and expression. Differences will always arise but we must respect one another’ right to think and speak freely. In order to protect these rights and freedoms, the Government of Southern Sudan has established a technical team to work on a Transitional Constitution. This will be presented to the current Southern Sudan Legislative Assembly (SSLA) to pass as a new Transition Constitution. The Transition Constitution will be the starting point for an extensive and wide consultative process to produce a permanent constitution for the new Republic of South Sudan; a constitution which fulfills the aspirations of the people. These consultations and the enactment of the permanent constitution will take place under a broad-based government, to be appointed after July 9th, 2011. Distinguished Citizens, in addition to preparations for the Transitional Period, we do have a number of priorities to attend to, which include among others, addressing the outstanding CPA issues: notably the Abyei Protocol and the North-South border; reaching an Agreement on post-referendum issues; addressing the security and economic challenges; focusing on, and working to meet the huge expectations of our people. 1. The SPLM and the NCP must work together to find a solution on Abyei and the North-South border. 2. The Popular Consultations in the Two Areas of Blue Nile and Southern Kordofan states must be implemented. 3. 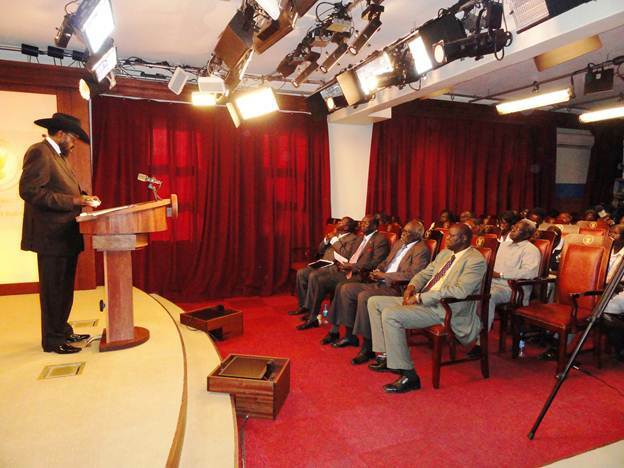 The SPLM and the NCP must resume serious negotiations to conclude an Agreement on Post-referendum issues. 4. The SPLM leadership will convene a meeting of the leadership of Southern Sudanese Political Parties on February 14th, 2011 to discuss the Transition. 5. Appointment of a widely representative Transition body to work out modalities for inclusion in the independence first government of the new Republic. 6. Regional and international engagements in order to gain expeditiously recognition for the new state of South Sudan. 7. Finally, convening of a donor conference to raise the necessary funds for the construction and development of the new state. Rural Transformation: Taking towns to the rural areas shall remain the number one priority in the new state. Since more than 80 percent of our people live in rural areas, intense agriculture shall be the major pillar for reform. Education, Training and Scientific Research: The rejuvenation of education in Southern Sudan shall be accelerated with a view to ensuring free universal basic education to all children. Health: Enlargement of primary health care to cover the whole of Southern Sudan. Physical Infrastructure: Achievement of multiple road connectivity: interstate in Southern Sudan; between North and South Sudan and between Southern Sudan and its neighbors to the East and South. In this respect South Sudan may become the hub of the Trans-Africa road network linking the North of the continent to its South and East to West. Public Service: This demands competent, efficient and disciplined working force while civility entails awareness of the public good. Peace, Security and the Rule of Law: Our people need peace: peace in their homes and luaks; peace in their communities and within communities, peace in the work place and peace in the streets. Women and Youth: Women’s role in society should never be underestimated. They raise and care for our children. They maintain cohesion in our families. Youth, on the other hand, had throughout the struggle animated our strive for liberty. Today they are at the forefront of a different war: the war for consolidating peace, building institutional structures from scratch and contributing to the development of our country. Their spirit of entrepreneurship is there to see in the market place. Reconciliation: Right from 2005, we decided to form an inclusive government and engaged with leaders of Other Armed Groups (OAGs). Currently Southern Sudanese Political Parties are engaged in discussions so as to forge ahead in building a new nation. First: To entrust the cause of War Veterans to the Ministry of SPLA Affairs which shall be called, from now on, Ministry of SPLA and Veterans Affairs. I expect the Ministry to come up with well – thought-out plans that shall cater for the needs of veterans. Second: I instruct the Ministries of Education and Labour, Public Service & Human Resource Development to give special attention/ consideration in education, training and employment opportunities, to widows and orphans. I also instruct the two ministries, alongside the Commission on War-disabled, Widows and Orphans, to formulate and implement policies for upgrading the capacity of those of the above groups who lack education or training to make them fit for the labour market. Third: I reiterate my election promise to establish a special fund, under my supervision, to cater for the needs of those groups. I appeal to our development partners to contribute to this effort. Fourth: I shall work out a retirement package to SPLM/A historical leaders to meet the needs of these selfless leaders who sacrificed everything for the cause of the people for over two decades. For those of them who are no longer with us, their families shall be entitled to the same benefits. We shall have zero – tolerance to corruption. Zero – tolerance to corruption, however, is not only a badge to be attached to the lapels of our jackets. It should be a culture. It should be an ethical commitment. It should be an attitude that guides our behavior. It should be part of our professional conduct. Environmental Protection was often tucked into different department as an add – on. Now it has its own place and shall continue to be so. Ever since the CPA was signed, and indeed long before that, the SPLM has been unequivocal on how the unity of Southern Sudan could be best maintained. We must strive and do everything possible to achieve and maintain the unity of our people. Those are the cardinal goals and essential principles that shall guide our government as a new state and with God’s help, we shall succeed. Dear brothers and sisters, we have fought and made enormous sacrifices for the freedom of our nation. In the field, we stood together as comrades in arms. Now we must stand steadfastly together as good citizens. We have before us a task that cannot wait – the task of building our new nation. Today we must allow ourselves to dream. We dream of South Sudan where children go to school without fear of air bombardments. We dream of South Sudan where every house is served with electricity and water. We dream of South Sudan where everybody has access to health care. We dream of South Sudan where every family has enough food on the table. We dream of South Sudan where all our sons and daughters live in brotherhood and sisterhood. We dream of South Sudan where we live at peace with our neighbours and the world. This is our dream and our task is to make it a reality. Our purpose is to give to our children what the war took away from us: peace, rule of law, food security, health care, good education, running water, clean water, electric power, and opportunity for the pursuit of happiness and prosperity. Let us all work to give our children hope for a better future. Thank you and God bless South Sudan. This entry was posted in Comprehensive Peace Agreement (CPA), Omar al-Bashir, President Salva Kiir, Southern Sudan, SPLM, Statements and Op-Eds, Voting Process and tagged African Union, Arab League, European Union, IGAD, John Garang, Juba, National Congress Party, referendum, Terrorism. Bookmark the permalink.